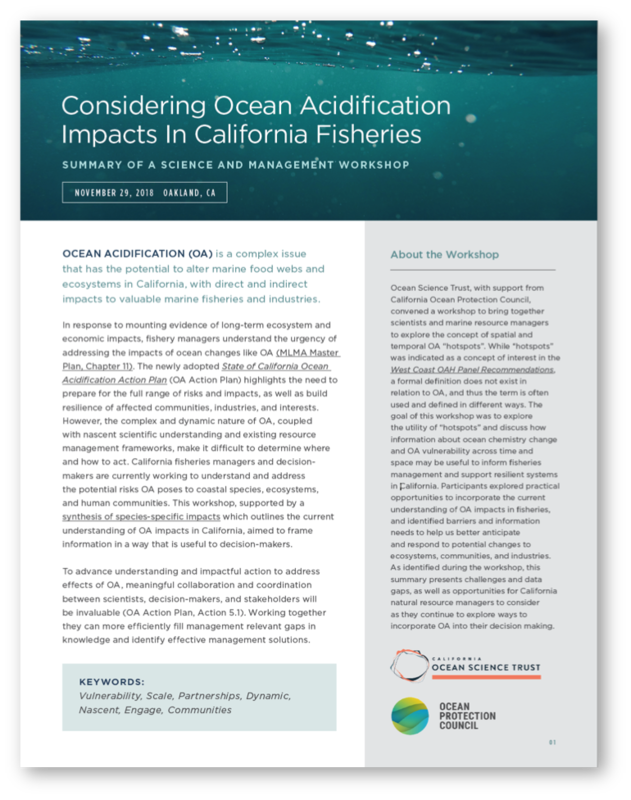 This workshop explored OA “hotspots” and how information about ocean chemistry change and OA vulnerability across time and space may be useful to inform fisheries management and support resilient systems in California. 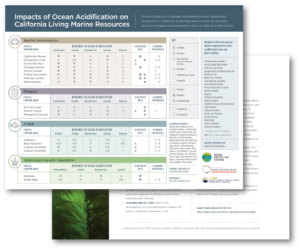 This summary presents challenges and data gaps, as well as opportunities for California natural resource managers to consider as they continue to explore ways to incorporate OA into their decision making. This work was inspired by a similar effort by the Alaska Ocean Acidification Network. This new California infographic is another step in illuminating potential impacts along the entire West coast. As a first step towards illuminating potential natural resource management solutions, Ocean Science Trust worked closely with scientists at UC Davis Bodega Marine Lab, the Ocean Protection Council and other partners to demonstrate the potential impacts of OA on important species and ecosystems in California. Taking inspiration from similar efforts in Alaska, we undertook a synthesis of current scientific understanding and developed communications material for use by resources managers. 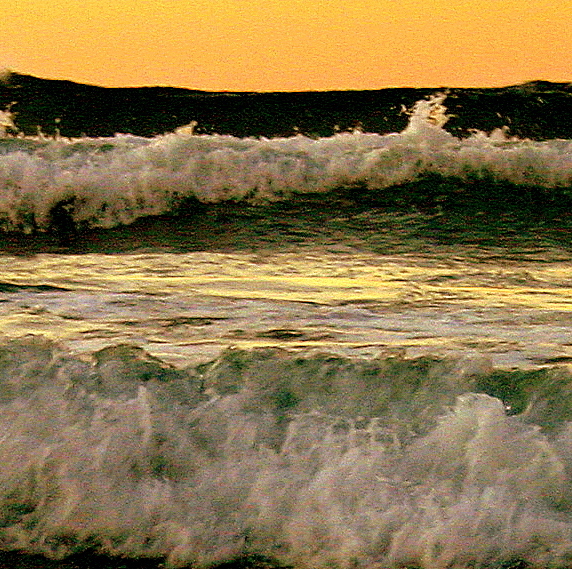 The species included in the synthesis represent a diverse subset of species considered as ocean climate indicators, commercially, recreationally, and/or ecologically important. This list was selected by the project team and vetted and augmented by OPC, CDFW, and aquaculture representatives. 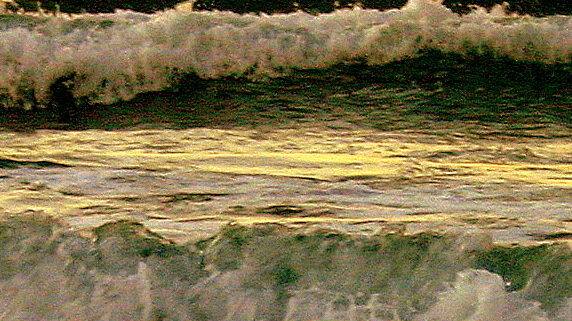 Building on this assessment, Ocean Science Trust hosted a workshop in November 2018, to help managers and decision-makers incorporate OA impacts information into relevant management decisions, prioritize efforts to address these impacts, and determine where to allocate resources to further increase understanding. This workshop brought together managers, policy makers, and scientists to better understand the concept of OA hotspots, ensure it is usable by state decision-makers, and identify key gaps in data and information that inhibit action. Workshop summary available here. Additional project support is provided by Annaliese Hettinger, Bodega Marine Lab, UC Davis.